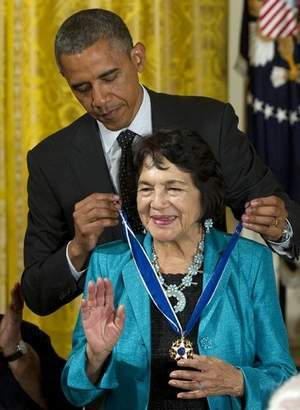 WASHINGTON – Dolores Huerta, co-founder with the late Cesar Chavez of the United Farm Workers and a pioneering organizer and activist for women, workers and Latinas, received the Presidential Medal of Freedom in a White House ceremony on May 29. Huerta was one of thirteen recipients of the nation’s highest civilian honor. The list spanned a spectrum of work, talent and backgrounds. Some like musical legend Bob Dylan, former Secretary of State Madeline Albright, Israeli President Shimon Peres, author Toni Morrison, former astronaut and Ohio senator John Glenn, Supreme Court Justice John Paul Stephens or University of Tennessee basketball coach Pat Summitt have more recognizable names and reputations. 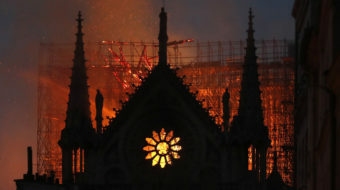 Others, made their contributions in a less intense media spotlight like civil rights lawyer John Doar, epidemiologist Bill Foege, anti-discrimination fighter Gordon Kiyoshi Hirabayashi, Girl Scouts founder Juliette Gordon Low and anti-Nazi hero Jan Karski. “It’s our job to let them know how extraordinary their impact has been on our lives,” President Barack Obama said after draping medals around the honorees. Huerta and Chavez co-founded the UFW in the grape fields of California 50 years ago, and the ceremony was a week after its convention, in Bakersfield. 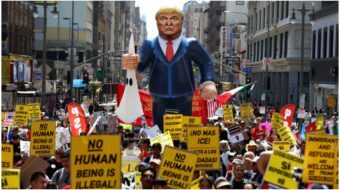 Under Huerta and Chavez, UFW gained national renown for its nonviolent grape boycotts and activism for farm laborers, many Spanish-speaking and all unprotected by labor law. UFW learned of the Medal of Freedom for its co-founder a month before. “Cesar Chavez once described Dolores Huerta as completely fearless, both mentally and physically,” current union President Arturo Rodriguez said then. Obama sketched the recipients’ impressive contributions to society in often poetic and sometimes personal terms. “Bob Dylan is one of the most important songwriters in music history. And that is the entire spectrum of recorded music history,” said Rock and Roll Hall of Fame director Howard Kramer. Documentaries, books and college courses all examine his role and writings. His “Blowin’ in the Wind” is now synonymous with peace and justice, translated into dozens of languages. He stood alongside civil rights leaders at the height of strife in the Deep South, his songs a soundtrack of those tumultuous times. “Bob’s voice, with its weight, its unique, gravelly power was redefining not just what music sounded like, but the message it carried and how it made people feel. Today, everybody from Bruce Springsteen to U2 owes Bob a debt of gratitude. There is not a bigger giant in the history of American music. All these years later, he’s still chasing that sound, still searching for a little bit of truth. And I have to say that I am a really big fan,” Obama said.